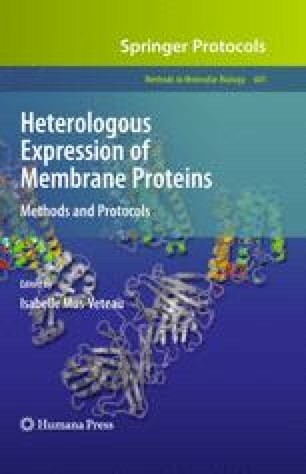 A critical step in any in vitro analysis of membrane proteins is the solubilization of the membrane to extract the protein of interest in an active form to obtain an aqueous solution containing the membrane protein complexed with detergents and lipids in a form suitable for purification and further analysis. This process is particularly delicate as the aim is to maximally disrupt the lipid components of the membrane while putting the protein components in an un-natural detergent environment without perturbing them. Looked at this way, it is remarkable that it ever works. Although the process is difficult and hard to master, an increasing number of membrane proteins have been successfully solubilized in active forms, allowing some general principles to be established that we illustrate in the method developed in this chapter. This work, and K.D., were supported by the CNRS and ANR (grant number Blanc-2007-1_183779).